Thank you to all who helped with the 2007 Charter Night. 2007 was Bedworth Lions Club's 30th Charter Year; celebrated in the wonderfully modern surroundings of the Windsor Restaurant, at Bede Village. Thanks to to our Latest Lion Geraldine, who is the community liaison person for the Bede Village complex. A	Superb meal followed by informative & entertaining speeches by The Mayor, District Governor, Lion President , & lion Vice President. Cheques on behalf of Bedworth Lions Club were Presented for the 2006 - 2007 Mayor's Appeal, & District Governor's Appeal. 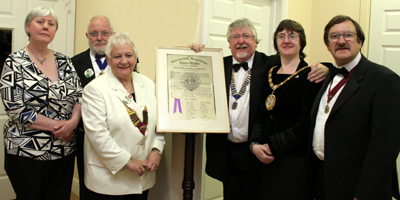 Once again - Thank you to all who helped with the 2007 Charter Night.